CMST develops technologies for structuring both hard and soft polymers from the millimeter to the nanometer scale, with a focus on applying microfluidics for (bio)medical applications. 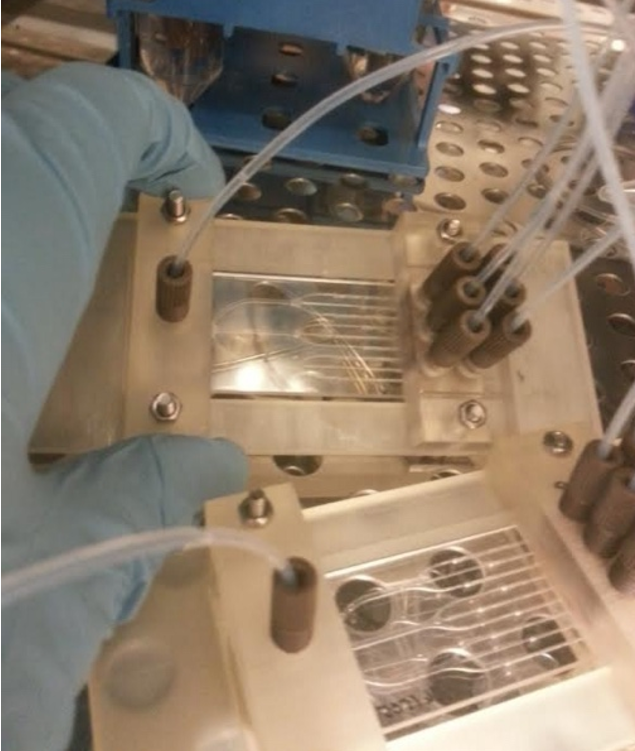 In collaboration with the PBM group (Polymer Chemistry and Biomaterials Research Group) at UGent, CMST was working on biodegradable polymers for microfluidics in the framework of the FWO project BioPOM. 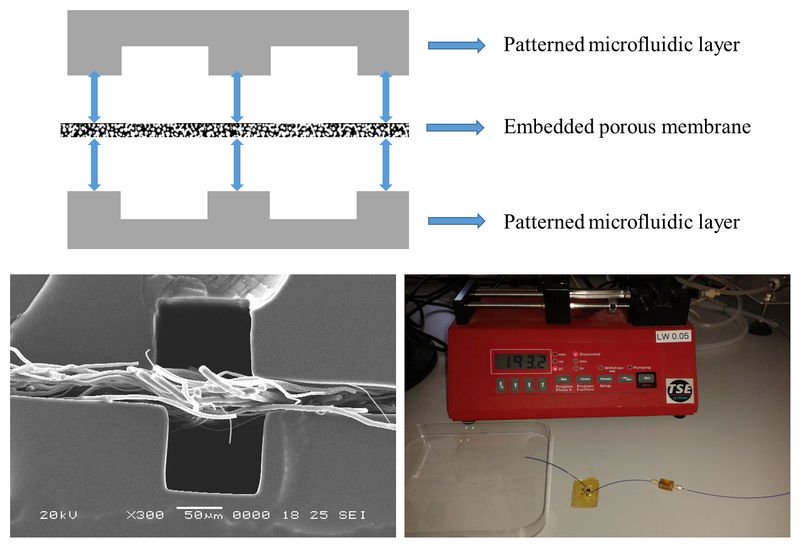 Novel biodegradable elastomers with tunable mechanical properties were synthesized and applied in the development of microfluidic devices. As up to now most cell and tissue culturing is done at best using flat uniform biodegradable layers, or 2-dimensional (planar) microsystems, the novelty of our work consists in inserting a porous membrane in the elastomeric microfluidic devices. Therefore, the key feature of the presented microsystems is that they contain a 3-dimensional environment (i.e. given by the porous membrane), which can be suitable for cell culturing and complex tissue engineering applications. Via this way, cells of different types can be cultured together and aligned according to their in vivo model. 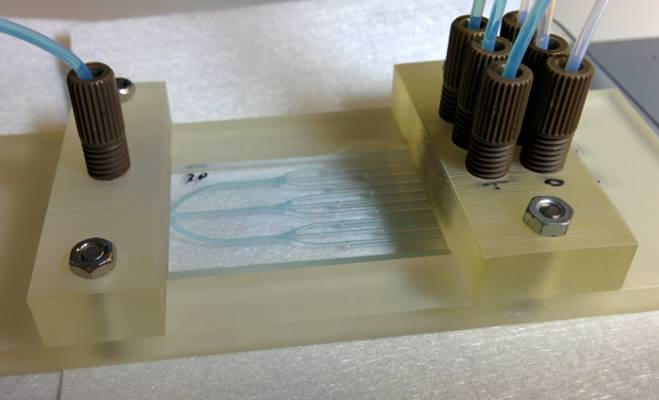 In the framework of the FP7 Project HeMiBio, CMST was delivering PDMS inserts for a microfluidic bioreactor for toxicology testing on hepatic cells. The manufacturing process is described on this page. Additionally, we were working on the hot embossing of a COC based 3D (flow over combined with flow through) bioreactor. In the pictures it can be seen that the channels are completely sealed and fully optical transparent.